For kids to enjoy a healthy smile for a lifetime, parents need to start practicing quality oral hygiene habits with their kids from a young age. Brushing needs to start once a child’s first tooth develops, with flossing to follow once two teeth touch. Parents also need to schedule a child’s first dental visit by the age of one or shortly after their first tooth develops, whichever comes first. Taking these steps will help parents better protect the long-term health of their kids’ teeth by lowering the risk for dental decay and disease. However, parents can also inadvertently harm their kids’ oral health if not careful when it comes time to brush. Many parents are using far too much toothpaste when brushing their kids’ teeth, according to a new study conducted by the Centers for Disease Control and Prevention. The study found that almost 40 percent of kids between the ages of 3 to 6 used more toothpaste than recommended by dentists during brushing. For young kids with still developing teeth, swallowing excessive amounts of fluoride can result in the development of permanently discolored teeth, a condition known as fluorosis. While the American Dental Association and the CDC recommend parents only use a “pea-sized” amount of toothpaste when brushing a toddler’s teeth, the study discovered these guidelines are simply being ignored. As part of the study, researchers from the CDC surveyed the oral hygiene habits of approximately 1,700 kids in the 3 to 6 age range. The surveys discovered that roughly 38 percent of the kids were using more than the recommended amount of toothpaste when brushing. This increases their risk of exceeding the daily recommended intake of fluoride for kids their age. When consumed in high amounts, fluoride exposure can cause fluorosis in young kids, which causes teeth to develop with brown spots or to appear dark or dingy. To prevent this condition, children under the age of 3 should be using no more than a smear of toothpaste – roughly the same size as a grain of rice – when having their teeth brushed. Young children are not only more susceptible to developing fluorosis, they’re also less capable of spitting out toothpaste after brushing, making it more likely the swallow it, reports the CDC. Fluorosis only affects the oral health of kids because the damage occurs when teeth are still developing under the gums. It does not impact the oral health of adults or kids who’ve developed all of their permanent teeth. The results of this study has served as a “red flag” for public health officials who now realize that most people don’t fully understand the guidelines for toothpaste use when it comes to their kids. In many cases, parents are simply guilty of brushing their kids’ teeth like they do their own, not realizing why the difference actually matters. Fortunately, through better awareness the CDC hopes that parents will learn from their mistakes and take the steps necessary to protect their kids’ oral health. Only use a smear of toothpaste – the size of a grain of rice – when brushing the teeth of kids under the age of 3. Between the ages of 3 to 6, parents should use no more than a “pea-sized” amount of toothpaste. To increase your kids’ interest in brushing, parents need to act like a role model by showing that you take the time to brush and floss daily. Kids under the age of 6 may want to brush on their own, but don’t yet have the dexterity to properly brush. It’s fine to let your kids brush on their own, just make sure you go back and clean any areas they may have missed. Make sure to demonstrate the correct up and down technique for brushing, not the back and forth motion most people tend to use. 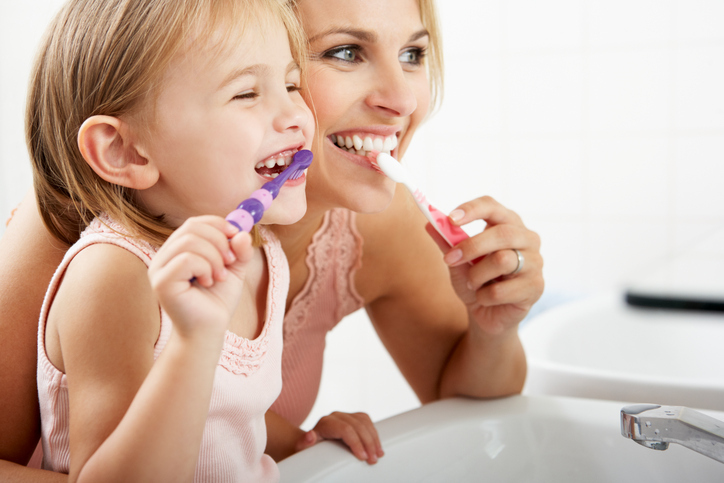 Change out a child’s toothbrush every 3 to 4 months just like you do for an adult. If you have any questions on the best ways to brush your child’s teeth, make sure to ask Dr. Johnson during your next visit to Oregon City Dentistry.